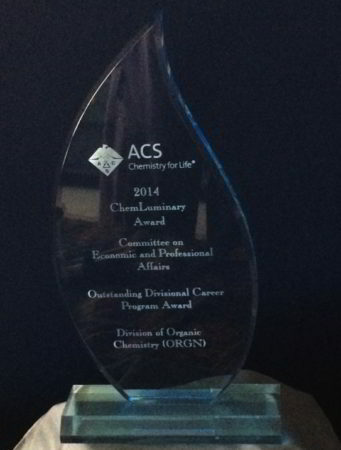 ChemLuminary Award for Activities in 2014. The Division of Organic Chemistry is recognized with an Outstanding Technical Division Career Program Award for the Young Investigator’s Symposium (YIS) held at Fall ACS meetings. The YIS provides great exposure and recognition for young, highly innovative industrial chemists to show their accomplishments in a national forum. Over 100 young scientists from large and small companies, government, and non-profit agencies have received the award since 2007. 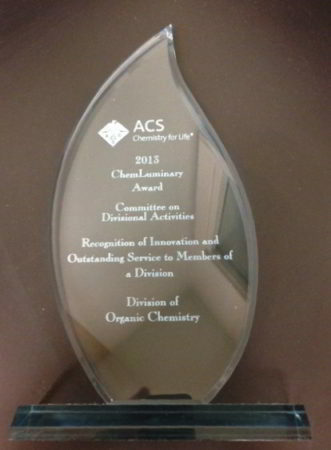 ChemLuminary Award for Activities in 2013. The Division of Organic Chemistry is recognized for the 2013 (4th) Annual Graduate Research Symposium (GRS) that was held at the University of Delaware, where 49 graduate students were selected from 38 institutions to present their research to peers and professional participants from academia and industry. The networking among the students was the greatest single benefit of this program. 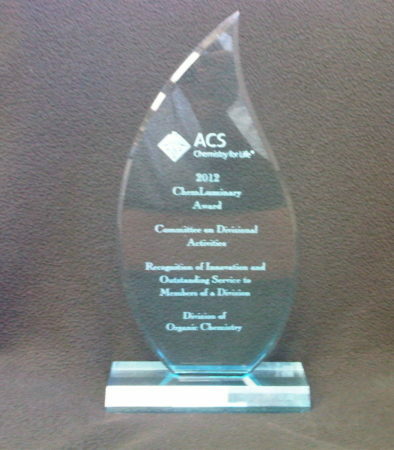 ChemLuminary Award for Activities in 2012. The Technical Achievements in the Organic Chemistry Award Symposium (TAOC) recognized outstanding contributions in the field of organic chemistry from accomplished chemists at the Bachelor’s and Master’s levels who are pursuing careers in chemical industry and research institutes. Symposium awardees presented their research at the 2012 ACS Fall National Meeting. The TAOC program was initiated in 1992, and as of 2013, there have been a total of 272 awards. ChemLuminary Award for Activities in 2011. The Division of Organic Chemistry annually awards summer undergraduate research fellowships (SURF) to outstanding organic chemistry students. The fellowships provide support for undergraduates to carry out independent research at their respective colleges/universities. Students then have the opportunity to visit the Pfizer Global R&D Center and present their research. 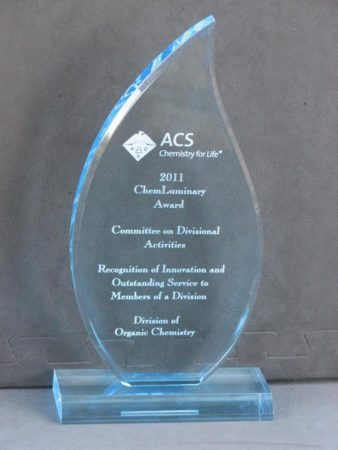 ChemLuminary Award for Activities in 2009. The Organic Division is being recognized for establishing an annual symposium to provide opportunities for Assistant Professors (details of the program) to present their work in a high profile setting at a national meeting preceding their tenure decisions. See C&EN 2010, 88 (41), 44. ChemLuminary Award for Activities in 2005. Outstanding Programming for Younger Chemists by a Division. The Division of Organic Chemistry – The Division of Organic Chemistry awards Young Researcher Travel Awards to aid young chemists in presenting papers or posters at the ACS National Meetings as well as sponsors fellowships to outstanding third and fourth year graduate students in organic chemistry. ChemLuminary Award for Activities in 2002. ORGN has one of the most impressive websites maintained by a Division. ORGN has established the Troyansky Endowed Graduate Fellowship. With industrial support, ORGN has increased the quantity and quality of support to graduate students. See C&EN 2003, 81 (41), 114. ChemLuminary Award for Activities in 1999. The Division of Organic Chemistry raised funds for 18 graduate student fellowships in the amount of $18,500 each. The division also maintains a website for employment opportunities in organic chemistry where prospective postdoctoral members and potential employers can register. See C&EN 2000, 78 (38), 74. 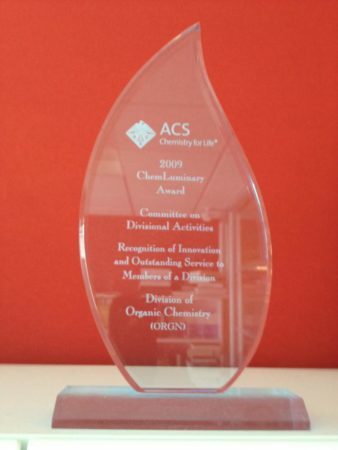 This award was in recognition of outstanding services of the Division to its members and for meritorious contributions to the chemical profession and public understanding of the fundamental importance of chemistry to mankind.